A polarimetric second harmonic generation (SHG) microscope was used to analyze the dependence between polarization and SHG signal from collagen-based samples. A theoretical model was also developed to investigate the SHG intensity as a function of different polarization states for a set of quasiparallel fibers. Numerical simulations were compared to experimental SHG intensity values and a fairly good agreement was found. 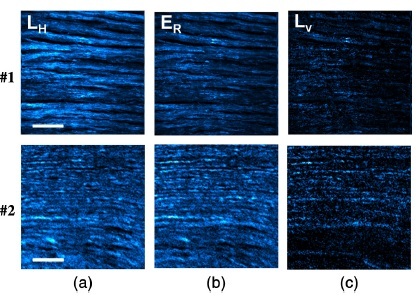 Linear polarized light produced periodical changes in the emitted SHG signal with a maximum of intensity corresponding to polarization parallel to the main orientation of the fibers, regardless the ratio of hyperpolarizabilities, ρ. A similar behavior was found for elliptical states located along a vertical meridian on the Poincaré sphere (i.e., null azimuth) although the modulation of the SHG signal was different. Our numerical calculations described a dramatic change in this regular trend when ρ changed from positive to negative values. Moreover, we provide an experimental method (based on the analysis of the modulation of the SHG signal) to determine the value of the ratio ρ and, consequently, to obtain information about the internal organization of the collagen fibers.